“Healing Wounds” go to the Video! Healing Wounds... AudibleMind dedicates his new single to those who in their lives find time to look back at their hopes, disappointments and goodbyes. All that has broken our wings and yet life goes on... because the light is within us, in our soul... always! Video clip production The video for "Healing Wounds" is completed ;-) Enjoy it! New studio The new studio is functioning well and is suitable for the new songs. 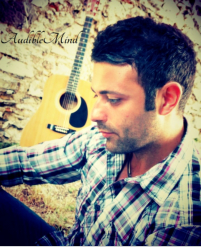 Next Single AudibleMind is about to begin work on the next song, which is a love song, a beautiful ballad. Future plans The album is plant to come out at the end of 2016. © 2009 - 2015 AudibleMind - All rights reserved.